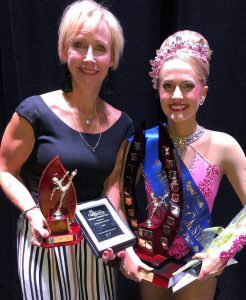 Congratulations to Ceres Senior and Sub-Junior Coach, Kathryn Andrews, who recently won the RSSS Calisthenics solo title in Ballarat. Kathryn also placed 3rd in the RSSS Graceful Girl title on the same day. This is on top of a win earlier this year in her Calisthenics solo in the inaugural Solos at the Palais competition. Well done Kathryn, everyone at Ceres is thrilled for your well-deserved success! 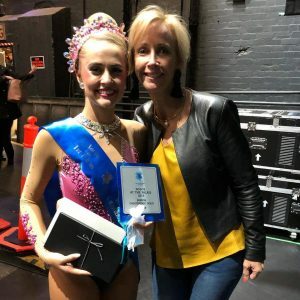 Kathryn is coached by Derryn Timms (Graceful solo) and Lynette Cousins (Calisthenics solo). Kathryn is pictured above with her coach Lynnette and some of her many awards.